This most auspicious Šri Rãma Navami is the day on which Lord Šri Rãma, the seventh avatar of Lord Šri Vishnu, incarnated in Ayodhya. The word “Rama” literally means the one who is divinely blissful and who gives joy to others, and the one in whom the sages rejoice. This important festival falls on the ninth day of the bright fortnight (Shukla Paksha) in the month of Chaitra and coincides with Vasant Navratri. The Hindu Temple Society of North America celebrates Šri Rãma Navami elaborately for nine days with special poojas, homams, pãrãyanams, abhishekam, bhajans, Šri Sita-Rãma Kalyãna Utsavam and Šri Rãma Pattãbhishekam. Šri Rãma Navami indicates the victory of goodness and the defeat of evil power and establishment of the dharma and removal of adharma. Please participate in Šri Rãma Navami poojas on all nine days and have divine darshan of Šri Rãma Parivar for happiness, success and prosperity for the entire family. Devotees are invited to join and sing along Šri Rãma bhajans on April 6 (Saturday), April 7 (Sunday) and April 13 (Saturday). Please sponsor during Šri Rãma Navami celebrations and receive the Blessings of Šri Rãma Parivar. Sponsoring info for this festival is given at the end of this page. 7:30 a.m. – Šri Ganeša Suprabhãtam. 7:40 a.m. – Šri Venkatešwara Suprabhãtam. 8:00 a.m. – Šri Rãma Tãraka Mantra Homam. 9:00 a.m. – Šri Rãma Abhishekam, Hãrati. 10:30 a.m. – Jãtakarma-Nãmakaranotsavam, Dolotsavam. 5:00 p.m. – Šri Sita-Rãma Kalyãna Utsavam, Šri Rãma Pattãbhishekam. Scheduled Šri Vishnu Sahasranãma will be at 8:15 a.m. instead of 8:30 a.m. Scheduled Šri Venkatešwara Abhishekam will be at 9:00 a.m. instead of 11:00 a.m.
Devotees may sponsor the following poojas and religious services online for Šri Rãma Navami. You may also sponsor at the Temple counter or over phone by calling: (718) 460 8484 Ext 112. Šri Rãma Navami – Dolotsavam – $11. 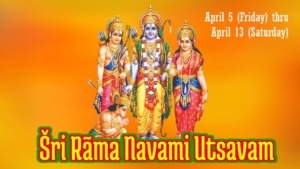 Šri Rãma Navami – Šri Hanuman Chãlisa/Šri Rãma Šloka Pãrãyanam – All Days – $75. Šri Rãma Navami – Šri Hanuman Chãlisa/Šri Rãma Šloka Pãrãyanam – One Day – $11. Šri Rãma Navami – Šri Rãma Navami Day – $101. Šri Rãma Navami – Šri Rãma Sahasranãma Pooja – All Days – $75. Šri Rãma Navami – Šri Rãma Sahasranãma Pooja – One Day – $12. 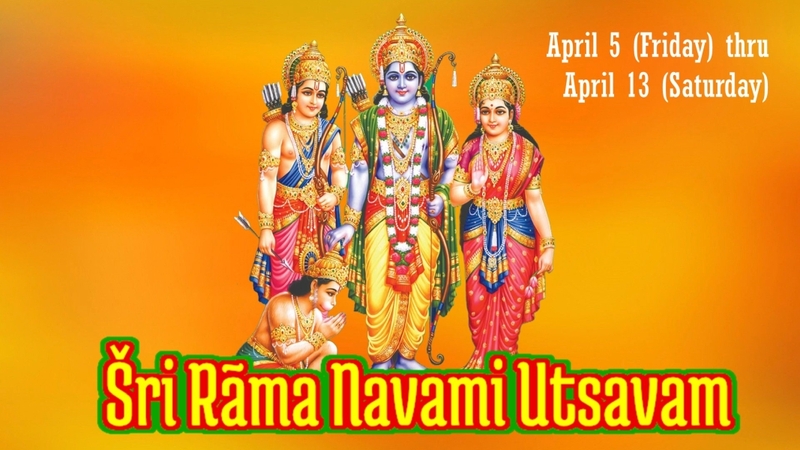 Šri Rãma Navami – Šri Sita-Rãma Kalyãna Utsavam – $31.